1747 map by John Warburton. about in order to keep to the contour. The source of the New River was springs of pure water around Ware, in Hertfordshire. 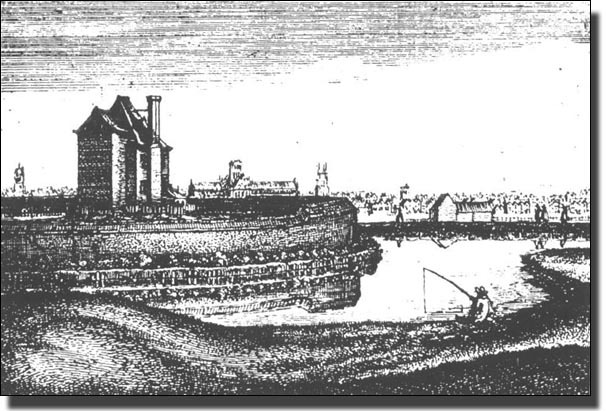 The springs were 20 miles north of the City and only 112 ft (37 metres) above the Thames. Great skill was needed to construct a channel along the sides of the valley to follow the contour. There was a fall of only 18 ft in 40 miles (14 centimetres a mile!) because, although Ware is 20 miles north of London, it had to snake 40 miles to travel along along the contour. Over 600 labourers were employed at a half-a-crown a day. Sir Hugh Myddleton, the engineer and driving force behind the project, was a determined, tough character. On one occasion, he was thrown into the river by a stumbling horse, disappeared under the ice, was rescued and carried on with no ill effects. When he ran out of money, King James paid half the cost of the work and it was completed despite much discouragement. The river was constructed by digging or embanking and lined with a thick layer of puddled clay from beds near London. In some places this method was not possible. In Highbury, for example, where the river had to cross the valley where Blackstock Road now meets Brownswood Road, there was a 'boarded aqueduct' lined with lead, 466 feet (150 metres) long. The New River at this time was an open stream all the way to Rosebery Ave, near Sadler's Wells Theatre. So much rubbish was thrown into it and so many Londoners considered it a free swimming bath, that the section from Highbury to Rosebery Avenue was put below ground, into a culvert. The path of the river can still be traced by the 'watery' street names and the extra wide gardens between the rows of houses which had been built on the sides of the river. Petherton Road, N5, has the New River running down the middle of the road in a 48 inch pipe, covered with grass and trees. As a compensation for depriving Londoners of their bathing, the Water Company, for many years, gave the water for London swimming baths, free. This encouraged the building of public swimming baths and slipper baths. Over the years, the 40 miles of river were shortened to 27 by cutting out the bends. The 1814 map shows the Old Cut,near the Tottenham border, which used to snake off along the contour and return, and the New Cut which shortened it. This shortening necessitated a high bank to build up the level to carry the water across without pouring out. This raised level can still be seen from Seven Sisters Rd at the junction of Amhurst Park. In 1810, the New River Company had about 400 miles of wooden pipes (elm) in the streets of London, serving only the ground floors of the houses. There was not enought pressure to force the water higher. The pipes lasted only five years so the streets were always up. 25% of the water was lost at the joints, where too the water became easily contaminated. Many of the pipes were carried on trestles above the ground. Children bored holes in them and bathed under them so a man had to be employed to search out and plug the leaks. 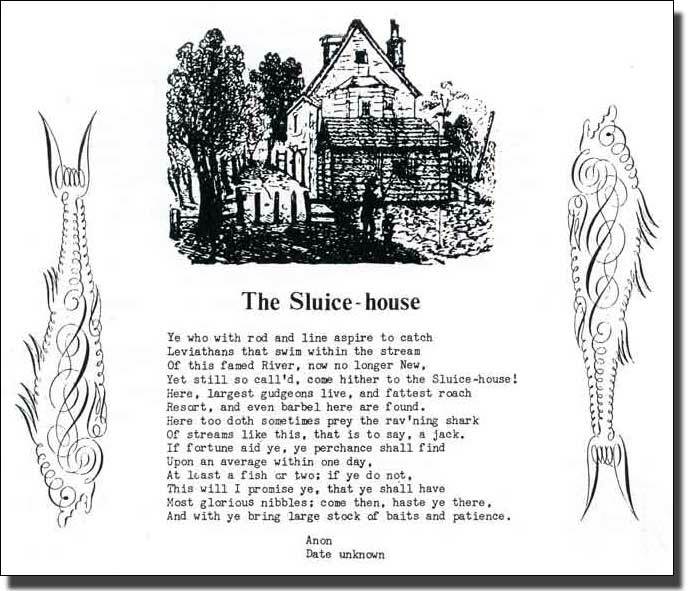 The poem and drawing are from an old broadsheet and the fish were popular pen-writing exercises when people had time and leisure to make handwriting into an art form. The fish are called Jacks (another name for pike) and they are ravening.